The star of Italian Carnival celebrations! The first official record declaring Carnival a public celebration in Venice dates to 1296, when the Senate of La Serenissima made the day before Lent a holiday of fun and merrymaking. In this respect, masks have always been a central component of the Venetian carnival, used to temporarily erase any distinction of social class, gender or religion. Mask makers were highly regarded, and gathered in a guild with their own laws. When Venice fell under the Austrian-held Kingdom of Lombardy-Venetia in 1797, Carnival celebrations, due to their subversive nature, were suspended. It was not until the 1970s that a revival of old traditions began with the opening of a modern mask shop. Events, parades and a special festive atmosphere dominate the calli and piazzas of Venice in the weeks of Carnival celebrations, while masquerade balls take place in the elegant palazzi, recreating the same atmospheres of times gone by. Visitors from Italy and abroad flock to the city. One of the most spectacular events of the Venice Carnival is the "Flight of the Angel", which takes place on Giovedì Grasso. A person suspended in the air, tied to a metal cable, descends from the top of St. Mark’s tower to the Doge’s Palace. The tradition dates to the mid-16th century, when a Turk surprised the Venetians with this gesture as a way to salute the Doge. 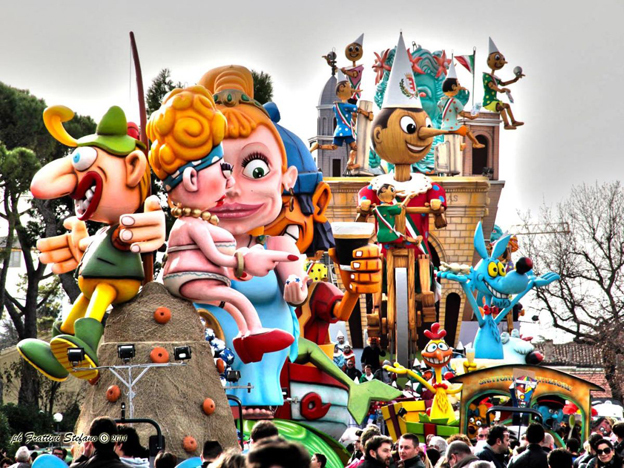 The Viareggio Carnival is among the most famous, and the most irreverent of all, in Italy. It originated in 1873 as a masquerade event for the upper classes unhappy at having to pay high taxes. 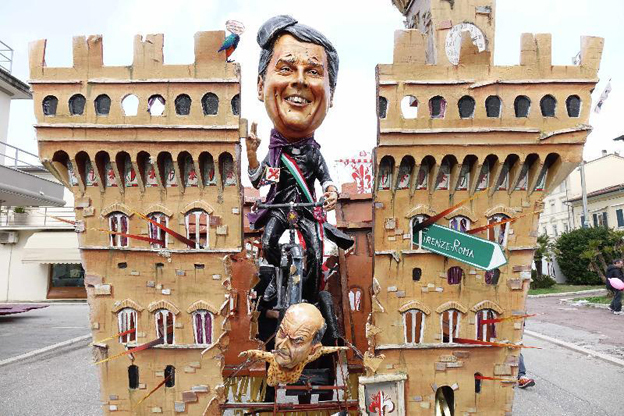 With time, its most original feature has become its huge animated parade floats, with gigantic papier-maché caricatures of politicians and celebrities. The event lasts a month, with celebrations held night and day: floats, parades, neighborhood events, masked dances, concerts, music, attracting thousands of visitors from Italy and abroad. The event has become so big that in 2001, the “Citadel” or Carnival town, was inaugurated, with hangars where the floats are created, a papier-mâché school and an arena for summer events. Celebrations in the streets find their origins in the so-called “colored all-night dances” (veglioni colorati) from the 1920s, where the women wore dresses of specific hues and dyes, and the men tuxedos. Decorations, confetti and tinsel stars also followed a specific color theme. Today, the local bars and clubs participate in the celebration, contributing to the extraordinary Carnival atmosphere. Held in the Piedmontese town of Ivrea (province of Turin), the world-famous Carnival of Ivrea stems from ancient neighborhood celebrations, but it was officially established only in 1808. The spirit of this Carnival celebration is to commemorate the expulsion from the city of a hated tyrant who was starving the population; he was chased away thanks to the rebellion of a miller's daughter (the mugnaia). This event took place in the Middle Ages. During the French occupation of Italy in the 19th century, the Carnival celebration was modified by adding representatives of the French army. 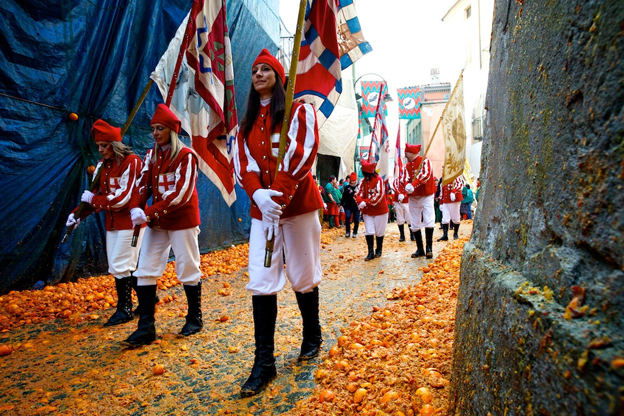 The Carnival of Ivrea is especially famous for the Battle of the Oranges, an allegory of the struggle for freedom. It re-evokes the civil war that broke out between the people of Ivrea and the royal Napoleonic troops. The re-enactment involves squads of “aranceri” on foot, representing the people, and squads of “aranceri” on carts, representing Napoleonic troops, throwing oranges (symbolizing arrows) at each other. Meanwhile, on the streets, the Mugnaia and her cortège distribute sweets and presents to spectators. The traditional procession through Ivrea features floats, folkloristic groups and music performers from all of Italy and Europe. The re-enactment of the battle fills the city with many colors and scents. Putignano is a town in the province of Bari, on the Murge Plateau in the Itria valley, an area in Apulia home to the famous trulli. The Carnival of Putignano is the longest in Italy, beginning December 26 and ending on Mardi Gras with an evening parade and the “funeral” of Carnival. The origins of this Carnival go as far back as 1394, making it one of the most ancient carnivals in Europe. That year, the Knights of Malta, then the governors of the area, moved the relics of St. Stephen from St. Stephen’s Abbey in Monopoli inland to Putignano to protect them from the Saracens. When the remains of the saint arrived, farmers halted their work to follow the religious procession, and when it was over, they celebrated with song and dance. According to legend, from improvised verses and satire in the local dialect arose the tradition of “propaggini”, a tradition that is still at the heart of the local carnival celebrations: dozens of poets take turns on the stage of the town’s piazza and recite for hours satirical rhymes to entertain the people. As in all Carnival celebrations, masks and papier-maché floats take over the town in an explosion of colors and cheerfulness. The Carnival of Cento, a town near Ferrara in Emilia-Romagna, has ancient origins as testified by a 17th century fresco painted by a Cento native, Gian Francesco Barbieri, known as Guercino; it displays a local mask, "il Berlingaccio" during a party thrown for the citizens on Shrove Tuesday by the town’s Magistrate in the city hall. While maintaining its historic connotations, the Carnival of Cento has now become an important folkloristic event because it was twinned with the Carnival of Rio de Janeiro in 1993. 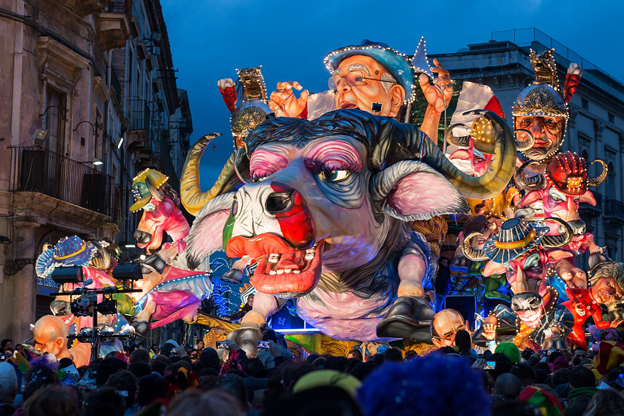 Float parades begin in the early afternoon and traverse the historic center several times, accompanied by music and masked dancing figures, while the Carnival’s patron leads the event in Piazza Guercino. One of this carnival’s original features is the launch of inflatable and plush objects from the floats to spectators; locals call it “gettito”. The Carnival runs for the five Sundays prior to Lent. On the last Sunday, an award ceremony is held for the best costumes, entertainment and music, and for the best “gettito”. As the last parade takes place, the local mask “Tasi” is burned, as a firework display lights up Cento. Sicily’s most beautiful carnival takes place in the Baroque town of Acireale, in the province of Catania. This Carnival also has ancient origins as, in the 16th century, a spontaneous celebration began in February where people in the streets would launch rotten eggs and citrus fruits at each other – until an edict banned it. In the 18th century, the Carnival began featuring the “abbatazzi”, folk poets improvising rhymes on the streets of Acireale. In the 19th century, the “cassariata” was introduced, a parade of horse-led carriages from where the nobility launched confetti and candy at spectators. Finally, in the 1930s, it was the turn of papier-maché masks and floats led by oxen, accompanied by satirical characters. Today, attracting visitors from all over the place, are the large “infiorati” floats, embellished with flowers. 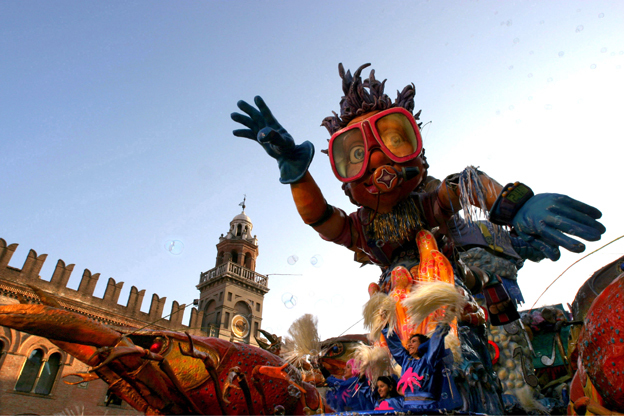 The seaside town of Fano in Le Marche region is home to one of the most famous and ancient Italian carnivals. Celebrations began in medieval times to mark the reconciliation of two local families. 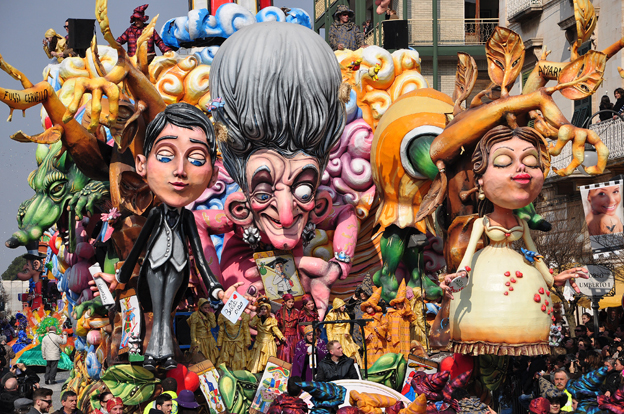 Some of its most original elements include the throwing of cioccolatini, chocolates, from the parade floats to spectactors (how’s that for a sweet Carnival?! ); the masks known as “vulons”, caricatures of the city’s most famous people; and “Musica Arabita”, where music is played using pots, pans and coffee cans.